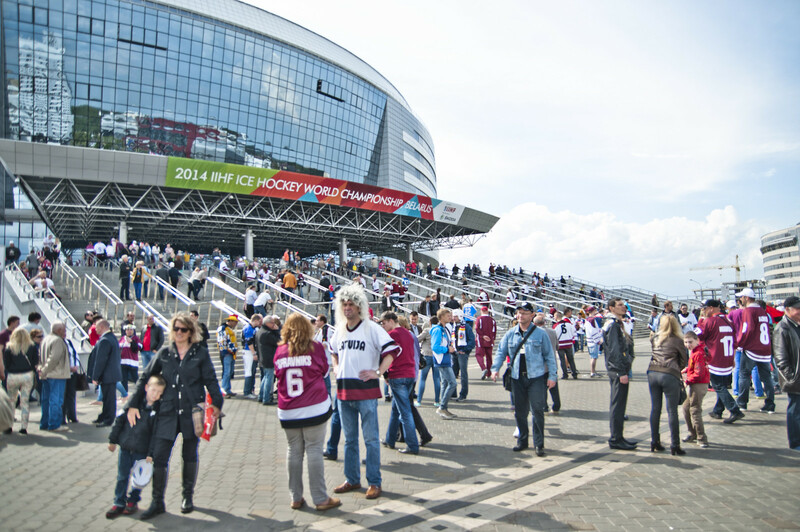 In May 2014, the annual Ice Hockey World Championships were held in Belarusian capital Minsk. 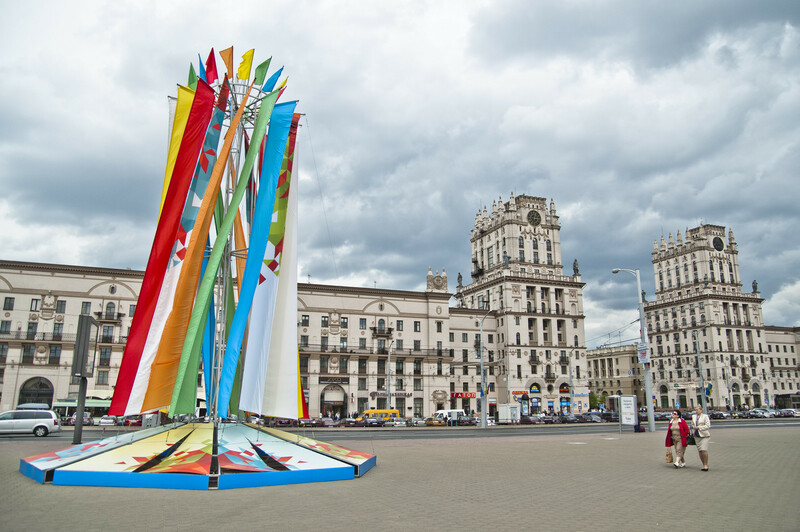 In the shadow of the matches, the authoritarian regime of President Alexander Lukashenko showed its true colours. Right on a street corner on the Independence Prospekt in Minsk a small dance group tries to create a welcoming atmosphere. Two elderly ladies and a man, all wearing traditional costumes, know how to inspire the surrounding tourists as well as locals. Attention is certainly theirs. Some of this attention is not welcome; barely two minutes after the start of the performance two OMON security forces appear. They meander through the crowd and exchange a few words with the dancer: The show is over. Unscheduled atmosphere is not tolerated by the Belarusian authorities led by President Alexander Lukashenko. As the Swedish NGO Swedwatch points out in a report, “forced labourers” were used during the construction of Chizhovka-Arena. This is the slightly smaller of the two stadia where the World Cup matches take place. According to Swedwatch, those “forced labourers” were prison inmates, alcoholics or homeless people. 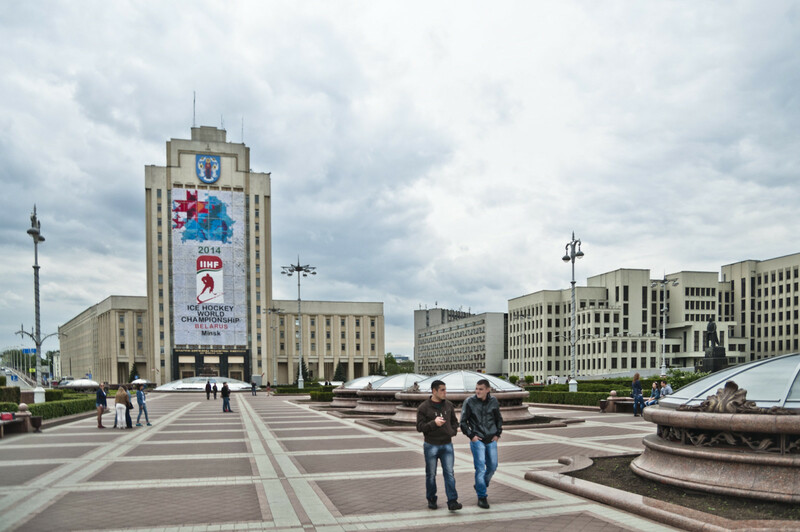 Furthermore the municipality of Minsk announced that it wanted to cleanse the city of all so-called “anti-social elements” in advance of the championship. For the authorities those “elements” are homeless people, alcoholics or prostitutes; it is common practice in Belarus to detain such people in special labour camps. In fact, in the streets people of that group are not visible, but this was not the case in the past. A Belarusian journalist who works for the independent TV station Belsat, which broadcasts from Poland, confirmed that those people were frequently battered by the police and maltreated. She considers tough intervention due to the World Cup to be a possibility. But she does not want her name to be published because, like many other critical journalists, she cannot officially become accredited in Belarus and could therefore get into problems with the authorities. After the aforementioned Chizhovka-Arena was completed in December 2013, hundreds of students of universities in Minsk “even members of the prosecution” had to support the final works, as representatives of the Belarusian human rights organisation Viasna explained. However, according to the activists, these unpaid work assignments were “regarded as normal, because it is perceived as a remnant of the Soviet Subbotniks.” Therefore, protests didn’t occur at all. However, far greater attention was paid to the arrests before and during the Ice Hockey World Championship. According to Viasna nearly three dozen political activists were arrested and sentenced to prison for 10 to 25 days during this time. Mikalai Babushkin who was held in jail himself for three days and later tried, even states that 250 people have been detained. Plus several others are hiding in the country, or have fled abroad, at least for the duration of the World Cup. “The practice shows that elite international events held in dictatorships significantly worsen human rights situations in these countries”, said Alyaksandr Atroshchankau during an OSCE press conference in Warsaw. Atroshchankau in the past spent a long time in prison due to his journalistic and oppositional activities in Belarus. 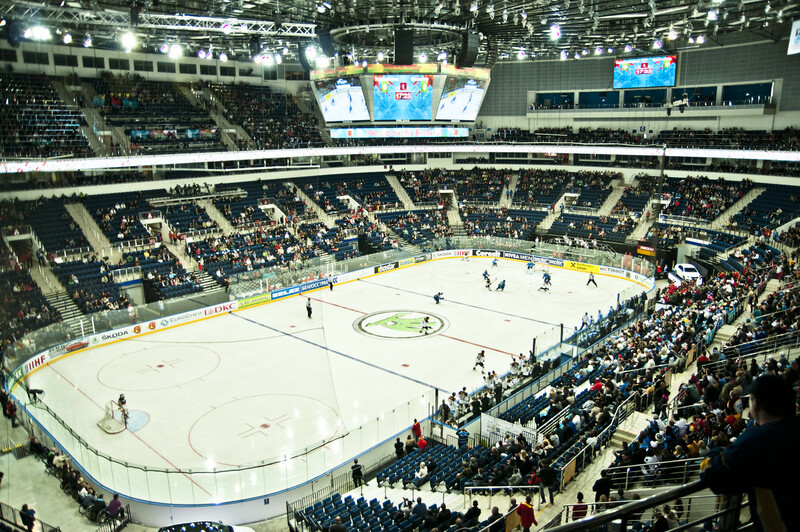 In addition to the Eurovision Song Contest in Azerbaijan and the Winter Olympics in Sochi, Atroshchankau explicitly denounced the Ice Hockey Championship in his home country. 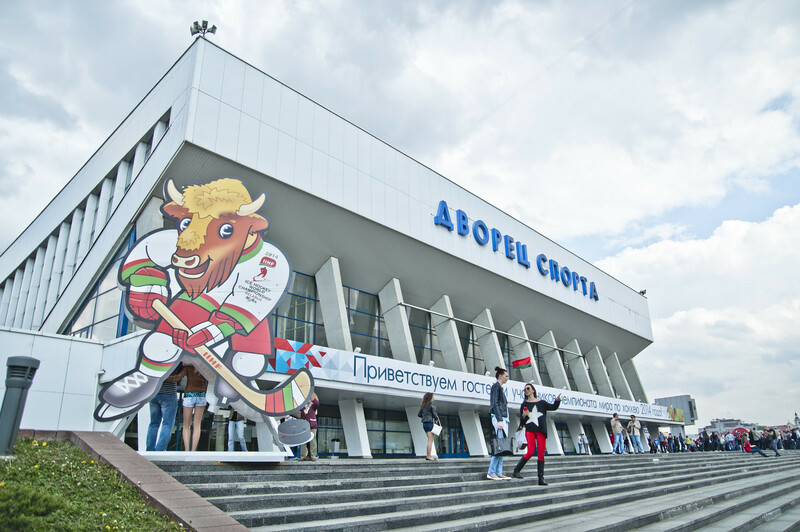 The Belarusian President added that he was pleased with the organisation of the World Cup, to offer “a great experience to all ice hockey fans”. But at least not all spectators in the sold out arena were convinced with this statement. As the anti-government news website “Charter 97” reports, during the live broadcasting of his speech on state television the background noise was muted at a certain point to prevent the apparently too loudly articulated displeasure of the visitors in the hall from being heard. Belarusian as well as numerous international human rights organizations criticized the championship’s organisation by “Europe’s last dictatorship”. The NGOs demanded the release of long-term political prisoners, including the founder of Viasna Ales Bialiatski and the former presidential candidate Mikola Statkevich, and the abolition of death penalty which continues to be applied in the Eastern European country. The last execution was indeed held during the Easter holidays immediately before the World Cup. But the President of the International Ice Hockey Federation, René Fasel, appeared unimpressed by any criticism and remained faithful to his position: “We separate sport from politics.” But the best counterexamples are the currently dozens of activists in Belarusian prisons who are locked away for duration of the World Cup. Easygoing ice hockey matches certainly look different in this light. This article was published on 23 May 2014 on “To4ka-Treff” and in Russian, too.